Build with the best by using a contractor whose B-BBEE compliance goes beyond the scorecard. 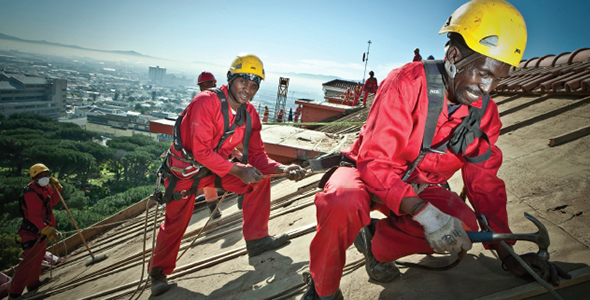 Scheltema, Cape Town’s leading roofing, ceiling and partitioning contractor, annually invests in building its people. The company also provides bursaries, learnerships and internships. Plus, in certain instances,employees are paired with mentors who over time impart their experience. Scheltema’s consistent delivery of top class workmanship. Tjeka Training Matters, where one employee attained a certificate in Building and Civil Construction. “Our employees are our biggest asset. By helping them to improve themselves, it benefits not only the business, but ultimately our clients” – Scheltema Financial Director, Dawn Clarke. Looking for material supply only then consider ROOFKIT, a division of Scheltema & Co.